DGR is finally back after another lengthy, lengthy hiatus! Let’s skip the preamble and get right to it. 2014’s first review features a very intriguing little gizmo from the woefully underappreciated Canopus Drums. Modern bass drum pedals are pretty well engineered. In fact, it’s hard to image most of the high-end pedals on the market today functioning any more effectively than they already do. We’re at the point where these machines offer an almost perfect translation of movement from the player’s foot to the beater. Quite simply, Pedals are stronger, faster and more reliable than they’ve ever been before. So, with that in mind, how much difference could an aftermarket add-on make? Let’s find out. The subject of today’s review is a rocker hub replacement unit sold as an individual upgrade for most of the bass drum pedals available today. Because most modern pedals feature unique hub designs, Canopus offers the Speed Star Bearing in several different configurations, each specifically tailored to fit a particular pedal (or brand). For this review, I received the SS-900IC for use with the Tama Iron Cobra. When I opened the package, I was actually surprised by how small and light the unit was. The bearing/hub assembly was barely larger than an American quarter, and it didn’t weigh much at all. 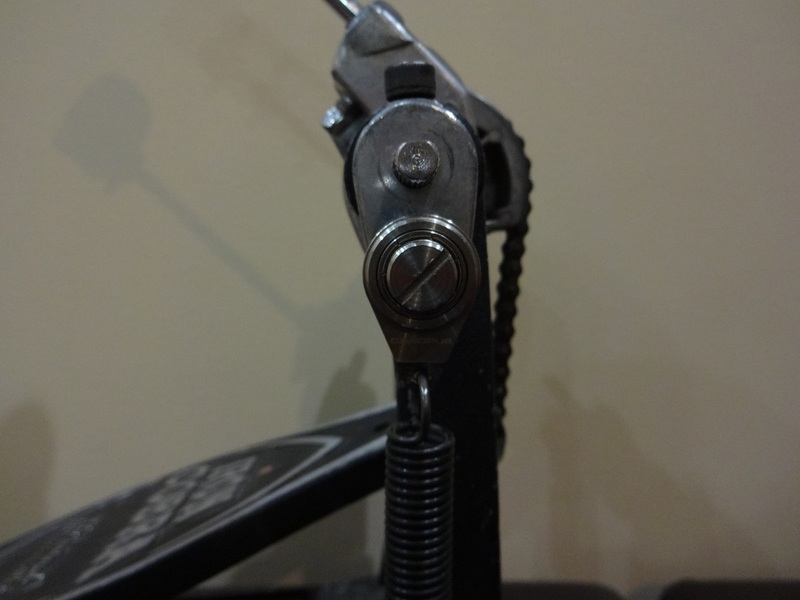 It also had a very sleek, understated design that fit in well with the rest of the pedal, which I really appreciated. Install instructions were included on a separate sheet. They were clear and easy to follow. The process itself took only a matter of minutes, requiring a simple screw replacement. The screw included with the Speed Star Bearing uses a flathead driver for tensioning, but the slot is wide enough for a coin or other slim, flat object in case you don’t have the proper driver handy. While a drum key-top bolt might have been preferable, this was still an easy enough alternative that it didn’t cause problems. In action, the Speed Star Bearing used a 100% stainless steel assembly mounted on a fixed axel to reduce friction created by the rocker hub. Now, I’m not an engineer, so the following assessment is entirely based on supposition, but it looked like the bearing, which was built directly into the hub, distributed the downward force applied by the tension spring more evenly around the assembly. That, along with the faster bearing design, reduced resistance on both forward and backward motion. Again, that’s all based on straight visual comparison of the stock hub versus the Speed Star. So, what does that do for the action of the pedal? Well, as far as I can tell, it speeds up the return motion (or down stroke), which, for some players, can make it easier to play faster. This is allows the pedal to play more quickly at a looser tension, so each stroke requires less effort. Much like a similar product I reviewed on this site last year, the Speed Star Bearing took a little bit of getting used to. At first, the return after each stroke was just too fast for me to deal with. Eventually, I found myself applying less force to each stroke, and that really seemed to solve the problem. I didn’t feel like I was sacrificing any power or volume, but each motion felt faster and more fluid than with the stock hub in place. Now, when playing that way, the Speed Star Bearing feels like a fantastic improvement to an already great machine. However, I tend to get a little stompy and aggressive when playing louder music. In those situations, the return action was so severe that I found myself finishing rehearsals with a bruise on the top of my foot where the beater head was striking on the down stroke. Of course, that’s not the product’s fault. It’s my fault for playing like I hate my kick drum. But, it might explain why this kind of bearing hasn’t been adopted as a stock option by pedal manufacturers. It might not be for everyone. The Canopus Speed Star Bearing is a simple and elegantly designed replacement hub that accelerates pedal return action, allowing for speedier strokes with reduced spring tension. It’s an effective unit that could certainly help a lot of players bump up their bass drum bpms with practice. It takes a little getting used to, but once you’re comfortable with the speedier response, the benefits are absolutely noticeable. It’s a little pricey at $65.00, but if you’re not happy with the speed or feel of your current kickers, it’s a much more affordable alternative to buying a new pedal entirely. I wouldn’t say it makes you lose the feel of the pedal. It just kind of speeds everything up. Reduces some of the effort needed to play fast strokes in rapid succession. I know that’s not a great answer, but I’m not entirely sure how to describe it otherwise. Once you dial in the spring tension to your desired setting, the action kind of finds a sweet spot between loose and tight. At least, that’s what it did for me. I hope that makes at least some sense. What kind of pedal are you playing? I’m actually not sure any of the models Canopus currently offers will fit the Taye pedal. I can ask the company if you’d like.